3D printing is improving medical technology one organ at a time. This best describes the new bone-mending technology developed at Northwestern University in Evanston, Illinois by Ramille Shah and her colleagues. They used ink made from a natural bone mineral called hydroxyapatite, mixed with PLGA, a mineral-binding polymer that makes the implants elastic. The 3D-printed hyperelastic bone. Credits: Shah, et al. 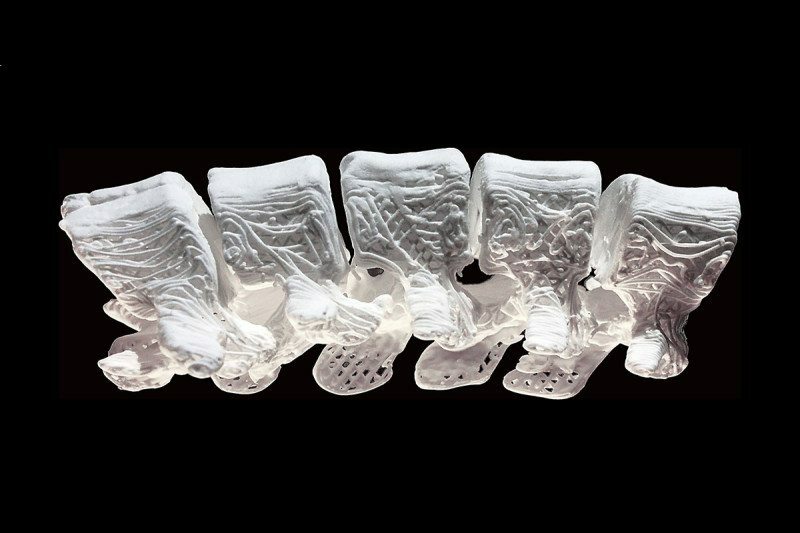 Yes, these 3D printed bones are bouncy — an unexpected feature that makes them more malleable during procedures. “We were very surprised to find when we squeezed an implant, it bounced back to its original shape,” says Shah. Her team has taken to calling it the “hyperelastic bone”. Once printed, these would-be bones are placed in the patient’s body where blood vessels rapidly infiltrate them and, by reacting to hydroxyapatite, gradually turn into real bones. Fellow researcher Adam Jakus says the hyperelastic bone mimics an actual bone’s pores and mineral content so closely that the body mends it like it’s just another incomplete bone. “It’s terrific, and a great advance,” Iain Hutchison, a maxillofacial surgeon at St. Bartholomew’s Hospital in London, says. “They’ve created a matrix, not a bone, and it seems they can grow bone on it without having to add stem cells or other growth factors,” he says. It is, indeed, quite an advance from the current ways used for bone surgery, all of which involve expensive and painful procedures. Now there’s a cheaper, more versatile option, thanks to 3D printing — proving, yet again, the extensive use 3D printing has in the medical field. “Our vision is to have 3D printers in a hospital setting where we provide the hyperelastic bone ink, so surgeons can make individual implants within 24 hours. You could make off-the-shelf, or patient-specific implants using scans from patients,” Shah explains. The study is published in the journal Science Translational Medicine.